The fashion industry has the terrible habit of launching a designer, claiming they are a genius and then discarding them to move onto the next big thing. Yet it is always more interesting to give a designer the time to start their business, develop it in a gradual way and regularly check about how they are getting on with their work. The last time we heard from Cologne-based Eugen Laitenberger he had just released the first collection of shirts and ties for his menswear label GUNEE Homme. The young Creative Director, graphic designer, illustrator and photographer has now moved onto his second collection and seems more focused than he was when he launched GUNEE two years ago. "02. Mountain Trip" is based on Laitenberger's bold graphics and his passion for high-end tailoring: the new prints for the shirts are inspired by nature and their palette, going from grey-black-white to aquamarine-blue and ochre-mustard, is suspended between earth and water, realms that prompted Laitenberger to give his new designs names such as "Spruce", "Mountain Peak", "Gravel", "Fog", "Aquatic Plant", and "Plankton". The collection is accompanied by a campaign inspired by an intriguing theme - the transformation a human being goes through while climbing a mountain and being exposed to the sublime power of the elements. The last time we heard from you, you were busy working on multiple projects since you are a fashion and graphic designer but also an illustrator - what are you up to at the moment? Eugen Laitenberger: I'm currently working on putting the final touches to the new collection. Art-wise, I'm still working on my "Cat Sequence" illustration and sculpture project - I hope to finish the illustration part at the end of the first quarter, so that I can start something new, though my focus is mainly on GUNEE Homme, at the moment. Which aspects of GUNEE have you been developing in the last few months? Eugen Laitenberger: We worked primarily on technical aspects like distribution and production. We also focused on the visual presentation of the current collection and on some new products to expand our line. It is an unexpectedly long process, in part due to my perfectionism. Yet, being the head of my own label, I can set my own deadlines. I believe it is important to think about all the things and processes I'm working on, rather than throwing some new products on the market as fast as I can. I'm a really impatient person, but I perfectly understand that it is very important to have enough time to review my own decisions. Your new collection features graphic prints that seem to be inspired by nature, can you tell us more about them? Eugen Laitenberger: The new collection arose from the inspiration of two pictures: "Wanderer above the Sea of Fog" (1818) by Caspar David Friedrich, and my illustration for the "Cube Cat" (View this photo). The latter features two cartoonish cats on the bottom and two mountains in the background, behind them. I imagined climbing my mountains and wondered what it would look like once you got to the top and you were exposed to the sublime surroundings and the landcapes. That's how I came up with the name of the collection - "02. Mountain Trip". With this collection I therefore created the structure and the layer of that landscape. 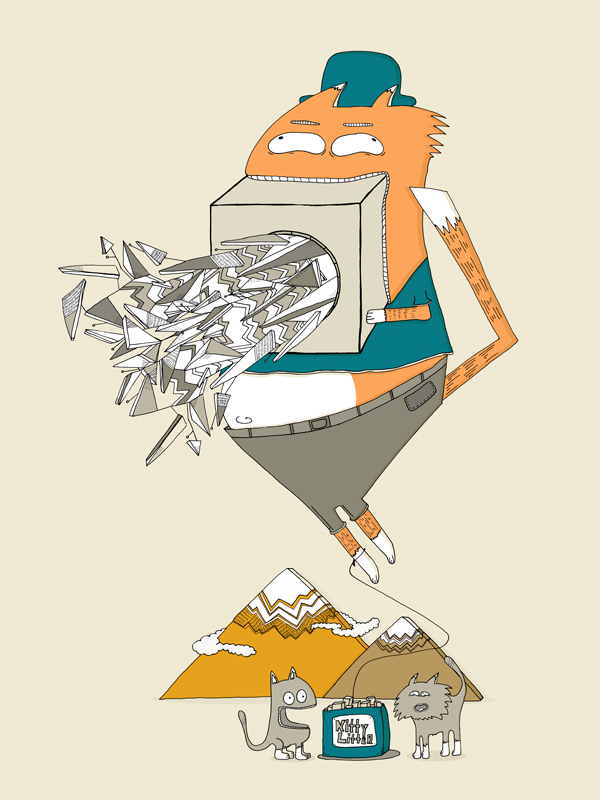 I also transformed the mountain from my illustration "Cube Cat" into a pattern for my "Mountain Peak" shirt. The campaign that accompanies the new collection features several photographic images digitally altered in an arty way - some of the images in the campaign evoke Arcimboldo's paintings and the themes of transformation and natural camouflage, what kind of themes influenced your campaign images? Eugen Laitenberger: I entrusted the visual language of the campaign to my photographer. I worked for a long time with Studio Peripetie and I trust her work 100%. I gave her the input, the inspiration and the idea behind the collection and she transformed it to her own view. The main idea of the campaign was the question: "What happens to a person that goes onto a mountain trip?". Climbing a mountain has something to do with an identification process. A trip can be easy at the beginning and very heavy in the middle and/or the end. Sometimes you reach the peak and sometimes you don't. The longer the trip, the more you become the mountain - that's how the idea for the digitally distorted layers was born. The model in the campaign is the matrix of the mountain and wears the pattern of the landscape onto his body. Can we buy the pieces directly from you and how does it work your made-to-measure service? Eugen Laitenberger: At the moment you can directly buy the pieces of the first collection (01. Prelude) from us. We are working on an online store to simplify the process. In future you will be able to buy GUNEE Homme and my illustrations from the site GUNEE Gallery. Furthermore, we are in contact with a few boutiques and will release a list of stockists as soon as we are ready. The made-to-measure service is for the moment focused on our region in Germany, because it's easier to work on your body than on your virtual one (via photos etc); it is also cheaper because we do not have to charge the client the shipping costs for the prototype. But, if you are interested in having a made-to-measure service, you can contact us even if you are somewhere else in the world. You will have to provide us with your measurements and we will produce the first prototype with your measured data. After the feedback, we will produce your personalised GUNEE Homme shirt. Film and music play a great part as inspiration in your work, what kind of films/music have you been watching/listening recently? Eugen Laitenberger: To be honest I did not find the time to watch many new movies or listen to a lot of new music. The last good film I saw was Submarine by Richard Ayoade. The soundtrack is great as well. I have been listening a lot to "Stonemilker" by Björk, "Like Blood Does" by Why There Are Mountains, "Song Seven" by Interpol and "Ocean Death" by Baths. I developed a new hobby last year – collecting limited vinyl LPs! Last year during record store day, I found a limited red vinyl LP of Placebo's eponymous debut album. I felt like I was 16 again when I went home with it. I'm too young to remember a time when people bought LPs, but I'm old enough to remember buying CDs and having no Internet. It was great being the first one in the store who bought the new album of your favourite band, and then opening the booklet and absorbing every second of each song. I think that's a feeling that has gone lost. I see the advantage of cloud and streaming platforms, but they are so impersonal: you spend money and buy music and other products that you end up not owning because they are trapped somewhere in a cloud. You also lose the experience that surrounds the music - the package, the booklet and so on. My new hobby partially gave me back that lost experience from my childhood. The only problem is that I now have to find the time to buy a record player for my new hobby! The menswear shows for the A/W 2016-17 season have just finished – have you been following any shows and are there any brands you particularly like? Eugen Laitenberger: I followed some shows, but don't have any brand I would highlight. I liked some pieces from the military touched collection by Dries Van Noten and one or two pieces by Yohji Yamamoto, Ann Demeulemeester and Kolor. Many fashion designers are subjected nowadays to pressures as sales seem to be more important than creativity – what do you think about this perennial battle between profit and creativity? Eugen Laitenberger: I think that, if you are a designer and put sales before creativity, then you should think about changing your job. One of the main reasons for this discrepancy between creativity and profit has been the structure of many companies, especially those ones that are not in the direct hands of the designers, but are managed by huge groups with shareholders. The main aim becomes therefore increasing growth and sales. I never understood this system and will never do. I don't know why it is so important to maximize your sales volume every year and why it is an apocalypse when you have a stagnation in your balance sheet. Profit is profit but creativity can not grow if your shareholders tell you that you have to do six collections a year and give you only three to five weeks of time to make them. How can this work?! I guess that, if you can live with the fact that sales are more important for you than creativity, then you can do this. Otherwise you have to sit down and wonder if you are prepared to adapt yourself to the system. I personally think freedom remains the most important thing for me, and that you also have to give priority to the things you love to do rather than to how rich and famous you can be. Sometimes it's more important to reach one special person with your art than 10,000. I know that sounds idealistic and this one person will not allow you to pay the rent for your flat, but there are other options as well, like being a designer and maybe having a part-time job, such as working as a taxi driver. For me the key stands in balancing all these aspects and managing your life in a sustainable way. All images in this post courtesy Eugen Laitenberger / GUNEE Homme; images 1 to 4 in this post by Studio Peripetie.